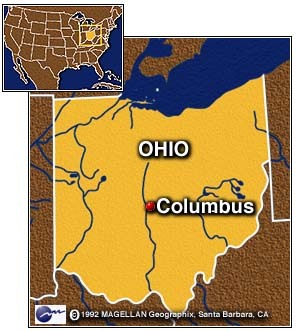 COLUMBUS, Ohio (CNN) -- The Clinton administration's plan to launch a military strike on Iraq ran into plenty of flak in the American heartland Wednesday. 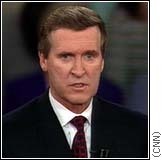 At a town meeting held in St. John Arena at Ohio State University and aired exclusively on CNN, Secretary of State Madeleine Albright, Defense Secretary William Cohen and National Security Adviser Sandy Berger encountered a noisy, opinionated crowd and considerable opposition to another war with Iraq. Albright was drowned out at one point by a group chanting, "One, two, three, four, we don't want your racist war," as she tried to explain U.S. policy to the audience of 6,000. The heckling became so intense at one point that Albright interrupted CNN's Judy Woodruff and said, "Could you tell those people I'll be happy to talk to them when this is over. I'd like to make my point." Similar outbursts greeted Cohen and Berger as they laid out again a U.S. position that is familiar to those who have followed the building crisis in the media. They said the United States would prefer to see a peaceful resolution and hopes that U.N. Secretary-General Kofi Annan will make significant progress when he visits with Iraqi officials this weekend. But if Iraqi President Saddam Hussein doesn't allow U.N. arms inspectors to have unrestricted access to all weapons sites in Iraq, they reaffirmed that a U.S.-led coalition will respond with military force. While those opposing a "racist war" were a tiny, if vocal, minority, there were many others in the audience who agreed with a veteran who asked if "we're going to do it half-assed the way we did before?" A caller from Oklahoma echoed that sentiment, asking, "How many times are we going to send our children and our children's children to fight Saddam Hussein?" "We've spent seven years containing him at no loss to U.S. lives," Cohen said, adding that an attack would reduce the threat of "chemical and biological weapons that will pose a threat to your children and grandchildren for the future." Another caller noted that the U.S. encouraged an uprising in southern Iraq but did not help those who responded, and that they were subsequently "slaughtered" by Iraqi troops. "Our policy has been to support opposition groups, and it continues to be our policy," Cohen began, but he was drowned out by chants of "Bull----! Bull----!" Another member of the audience screamed at the chanters, "Shut up!" 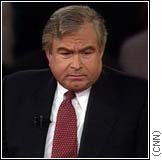 One young man asked Albright why the United States is willing to attack Iraq while ignoring actions by other countries. 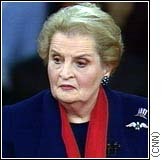 Albright responded, "No one has done what Saddam Hussein has done, or is thinking of doing. He is producing weapons of mass destruction, and he is qualitatively and quantitatively different from other dictators." As shouts erupted from the audience, she added, "I'm really surprised that people feel they need to defend the rights of Saddam Hussein." "You're not answering my question, Madame Albright," the questioner said. "As a former university professor," Albright said, "I suggest, sir, that you study carefully what American foreign policy is. Every one of the violations has been pointed out on what is not right, and I would be happy to spend 50 minutes with you after the forum to explain it." Berger told the audience that should military action be necessary, "the cardinal principle of the planning of this operation has been to seek to minimize civilian casualties. "Obviously, that's not possible (to eliminate them altogether), especially when you're dealing with someone who uses people as human shields. But we have no intention of trying to wreak havoc on the Iraqi people." One heckler who made his way to a microphone asked how Albright, Cohen and Berger could sleep at night, knowing that innocent Iraqis would be killed and injured by any military strike. "We will not send messages to Saddam Hussein with the blood of the Iraqi people," he said. "If you want to deal with Saddam, deal with Saddam, not the Iraqi people." "What we are doing," replied Albright, "is so that you all can sleep at night. I am very proud of what we are doing. We are the greatest nation in the world ..."
She stopped as the audience rose and applauded. "... and what we are doing," she resumed, "is being the indispensable nation, willing to make the world safe for our children and grandchildren, and for nations who follow the rules." A caller from Germany who identified himself as a member of the U.S. armed forces, told the panel that he agreed with what they were trying to do. "And if lives need to be lost," he said, "let it start with mine." Although surprised by the opposition they encountered, the officials adjusted to the noise level and the probing questions. "This is a tremendous example of what democracy is all about," Cohen said. "People expressing opposition ... would not be allowed to do this in a number of countries, including Iraq." State Department spokesman James Rubin played down the tone of the meeting, and said Albright, Berger and Cohen "enjoyed it. They came away feeling that the overwhelming majority of the audience was very supportive of the goals of the administration." Ohio Congressman John Boehner, a Republican, had a different take. "If the Clinton administration's goal was to send a message to Saddam via CNN, this was an unmitigated disaster," Boehner said. "This is a matter of global security and international peace, and they turned it into the Oprah Winfrey show. Not surprisingly, it didn't work." Diplomats from Europe and the Middle East told CNN they thought the U.S. officials were poorly prepared. One diplomat from an Arab country close to the U.S. said the telecast revealed "a deep division" among Americans and that the administration "has not done a good job of explaining its policy." A representative from a European ally said, "The administration is claiming more support than they've actually got." Another major European ally called the meeting "a tactical mistake" by the administration because the show was almost certainly seen in Iraq and "may have inadvertently given Saddam Hussein good cheer." But the diplomats also said they didn't think the meeting changed the minds of any of the U.S.' allies. Correspondent Ralph Begleiter contributed to this report.